No doubt, the best way to keep a puppy out of trouble is to pair it with another, tolerant dog. (Thank you Penny, for putting up with Flick.) But even other dogs tire of the constant nipping and nagging a puppy unleashes on yard-mates. Other puppies are a godsend, as well, especially as it helps them too. But at times, inanimate objects must be called on to keep Flick burning energy when the rest of us have none to spare. Sure, we have the usual basket-full of store-bought cartoon characters and fuzzy things and some last as much as three days under the onslaught of razor-sharp teeth and relentless battling. Watching Flick, knowing what I know from designing a few things, I hit on the basic idea that puppies like inanimate objects that are, well, animated … that “fight back.” I’ve rigged a redneck puppy playground out of re-purposed stuff that seems to keep him busy and out of trouble … most of the time. A simple dove decoy is light and easy to carry for a 10-pound pup, and offers a satisfying “whomp” when dropped on concrete. A length of garden hose offers enough resistance to fool Flick into thinking it’s alive (sort of). 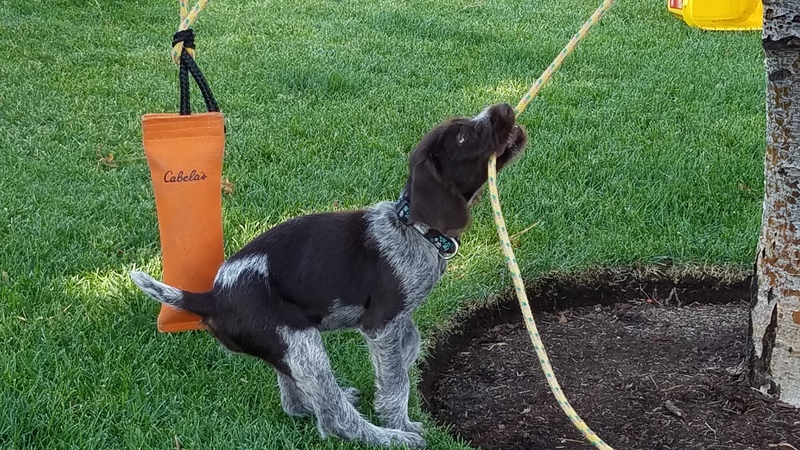 A shot bag (well laundered, twice), filled with sand, with a rope attached gives and takes and the weight alone might feel like a critter battling Flick to entice his attention. Empty water bottles, without cap and label, provide an enticing crunch when bitten, like rodent bones? A rope suspended from a tree limb, with a bell attached, is a great way to play tug-o-war without a human at the other end, forestalling hard-mouth. An upturned wading pool is a bit noisy when walked on, a little wobbly too. Two more shot bags, empty, taped to a length of PVC pipe, slap the little guy with every head shake … he can try all he wants but this gizmo is already dead. And my piece de resistance is a retrieving bumper hanging from a rope tied to another tree limb. It sways enticingly, bumps a pup as he pushes it, and always comes back for more. So, it may not look like much, but this yard keeps Flick entertained and the rest of us a little closer to sane.